These days, I like to keep everything simple when it comes to my go-to makeup. The more versatile the products are, the better. I'm a big fan of being able to use one product more than what it is meant for. Transitioning from summer to winter does not mean that you can't use minimal products onto your skin. The lighter the base, the better it is for the skin. Chi Chi Super BB Cream - This product is everything! It is a tinted moisturizer that contains anti-ageing, SPF, and vitamins that can help the skin with overtime use. When I went for holiday recently, this is the only base I brought with me and it did a great job. The coverage is amazing and I love that it is a 3 in 1 base so whenever I travel I won't be needing other extra stuff. 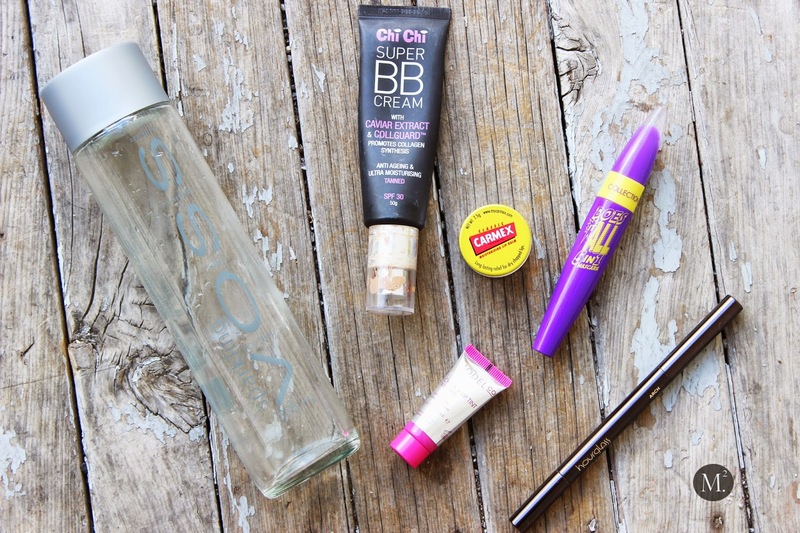 Collection Does It All Mascara - It really does it all! Holds a curl, lengthens, gives volume, and waterproof. I love this mascara because it does not flake off at all. The downside is it is a bit hard to take off so you'll probably need an oil based makeup remover. It is available in Countdown New Zealand. Model Co. Cheek & Lips - A perfect rosy tint for a healthy looking skin. For days where I have to rush, this is a good 2 in 1 product and comes in handy when traveling! You will need a tiny bit and it goes a long way. The consistency is a bit watery so giving it a bit of shake before use will help. I also noticed that it dries rather quickly so applying it fast is the best option with fingers or damp beauty blender. Hourglass Arch Brow Pencil - My ultimate holy grail brow product! This gives the most natural finish. The pencil is waxy and dry which is great for filling in the sparse areas of my brows. It is also great for holding my brows in place. I'd say this is the only brow product that I used up and have purchased twice! Carmex Lip Balm - Lip balm is a necessity for me as I do tend to get dry lips from time to time. I'm not fussed about lip balms but this is the brand that I'm currently using. I love the minty feeling that it gives and it does a great job on giving back moisture into my lips. I also use this to soothe my dry cuticles and it works fine! Water - I learned this the hard way but water is very important. Hydrating our body can do wonders especially in our skin. It plumps it and hydrates. I did suffer from dehydration and being in the hospital a couple of times which is not a good experience! I know drinking water can be boring but there are so many ways to jazz up the flavor! My favorite is by adding lemon, cucumber, and strawberries to give it that tingy sweet taste! This water formula is also great for detox!